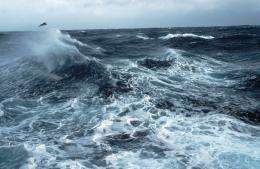 A team of British and Australian scientists has discovered an important method of how carbon is drawn down from the surface of the Southern Ocean to the deep waters beneath. The Southern Ocean is an important carbon sink in the world  around 40% of the annual global CO2 emissions absorbed by the world's oceans enter through this region. Reporting this week in the journal Nature Geoscience, scientists from British Antarctic Survey (BAS) and Australia's national research agency, the Commonwealth Scientific and Industrial Research Organisation (CSIRO), reveal that rather than carbon being absorbed uniformly into the deep ocean in vast areas, it is drawn down and locked away from the atmosphere by plunging currents a thousand kilometres wide. Winds, currents and massive whirlpools that carry warm and cold water around the ocean  known as eddies  create localised pathways or funnels for carbon to be stored. Lead author, Dr Jean-Baptiste Sallée from British Antarctic Survey says, "The Southern Ocean is a large window by which the atmosphere connects to the interior of the ocean below. Until now we didn't know exactly the physical processes of how carbon ends up being stored deep in the ocean. It's the combination of winds, currents and eddies that create these carbon-capturing pathways drawing waters down into the deep ocean from the ocean surface. "Now that we have an improved understanding of the mechanisms for carbon draw-down we are better placed to understand the effects of changing climate and future carbon absorption by the ocean." CSIRO co-author, Dr Richard Matear says the rate-limiting step in the anthropogenic carbon uptake by the ocean is the physical transport from the surface into the ocean interior. "Our study identifies these pathways for the first time and this matches well with observationallyderived estimates of carbon storage in the ocean interior," Dr Matear says. Due to the size and remote location of the Southern Ocean, scientists have only recently been able to explore the workings of the ocean with the help of small robotic probes  known as Argo floats. In 2002, 80 floats were deployed in the Southern Ocean to collect information on the temperature and salinity. This unique set of observations spanning 10 years has enabled scientists to investigate this remote region of the world for the first time. The floats are just over a metre in length and dive to depths of 2km. Today, there are over 3,000 floats in the oceans worldwide providing detailed information used in oceanic climate models. The team also analysed temperature, salinity and pressure data collected from ship-based observations since the 1990s. The instrument used for this is called a CTD profiler which is a cluster of sensors taking measurements as it's lowered deep down into the ocean to depths of more than 7km. More information: The paper  Localised subduction of anthropogenic carbon dioxide in the Southern Hemisphere oceans - is published in the August edition of Nature Geoscience (and online on July 29, DOI: 10.1038/ngeo1523 ) by Jean-Baptiste Sallée; Richard J. Matear and Andrew Lenton from CSIRO Marine and Atmospheric Research in Australia; and Stephen R. Rintoul from Antarctic Climate and Ecosystems Cooperative Research Centre in Australia. This study compliments a paper published in Nature 487, 313-319 (19 July 2012)  Deep carbon export from a Southern Ocean iron-fertilized diatom bloom  by Victor Smetacek, Christine Klaas, Volker H. Strass et al, which outlines the biological processes involved in how carbon is absorbed in the Southern Ocean. How does the ocean separate the anthropogenic carbon from the overwhelmingly more common natural atmospheric carbon??? It does not. Ocean will treat both the same. Distribution of CO2 goes through these sinking currents that determine how fast surface and deep waters can reach the same concentration when the amount of airborne CO2 changes. Currently the airborne CO2 is changing mostly because of human pollution.